"Everything that's rousing and distressing about block-and-tackle football is encompassed in Tropic of Football. . . illuminating." Football is at a crossroads, its future imperiled by the very physicality that drives its popularity. Its grass roots--high school and youth travel program--are withering. But players from the small South Pacific American territory of Samoa are bucking that trend, quietly becoming the most disproportionately overrepresented culture in the sport. Jesse Sapolu, Junior Seau, Troy Polamalu, and Marcus Mariota are among the star players to emerge from the Samoan islands, and more of their brethren suit up every season. The very thing that makes them so good at football--their extraordinary internalization of discipline and warrior self-image--makes them especially vulnerable to its pitfalls, including concussions and brain injuries. Award-winning sports historian Rob Ruck travels to the South Seas to unravel American Samoa's complex ties with the United States. He finds an island blighted by obesity, where boys train on fields blistered with volcanic pebbles wearing helmets that should have been discarded long ago, incurring far more neurological damage than their stateside counterparts and haunted by Junior Seau, who committed suicide after a vaunted twenty-year NFL career, unable to live with the demons that resulted from chronic traumatic encephalopathy. 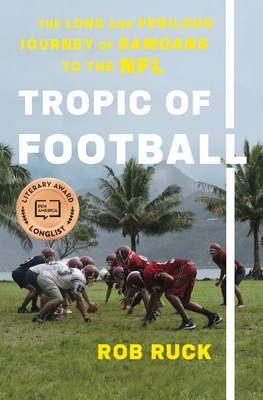 Tropic of Football is a gripping, bittersweet history of what may be football's last frontier. Rob Ruck is a professor of history at the University of Pittsburgh. His documentaries includes The Republic of Baseball: Dominican Giants of the American Game. He has written for the New York Times, the Washington Post, the Wall Street Journal, Salon, and other publications. He lives in Pittsburgh.